The reconstruction of the roundhouse’s skylight over the stands 1 to 3 will soon reach its final. 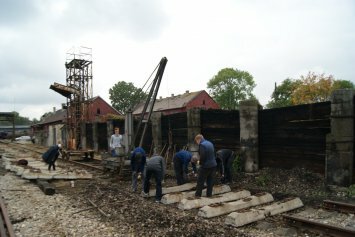 Therefore, this part of the roundhouse has now perfect condition for storing the most valuable, restored exhibits. 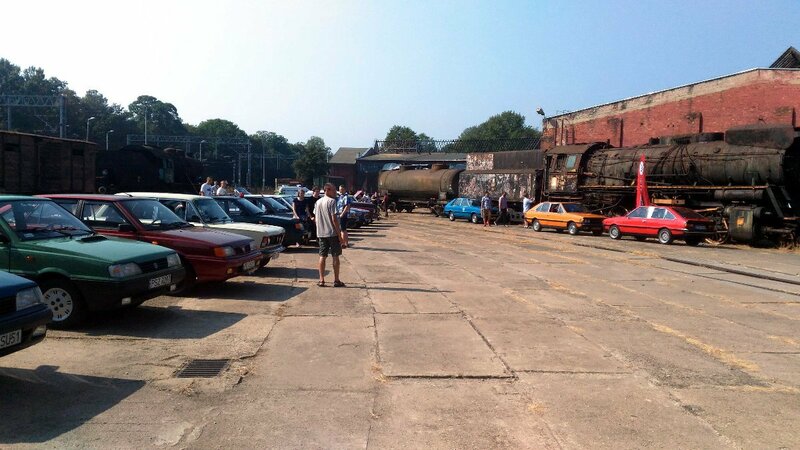 We decided to relocate here all those vehicles which till now were placed in various spots in the Shed. 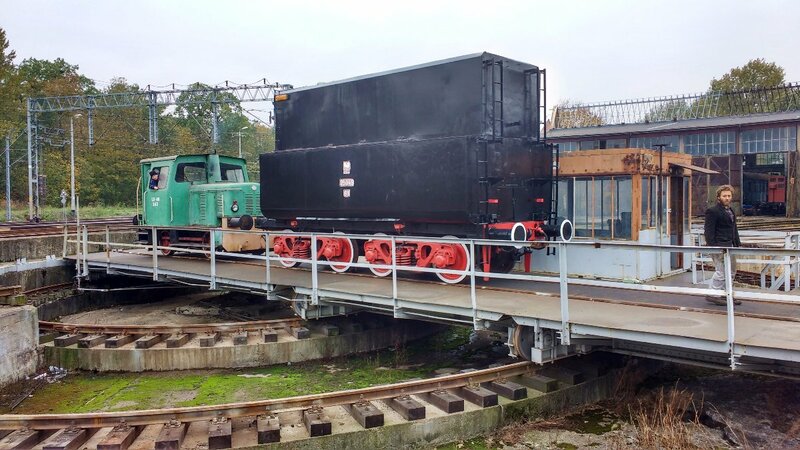 First to move under the new roof was steam engine class Ol49-4, which renovation will be soon over. It found its place on stand 3, next to the Wittfeld battery motor unit. 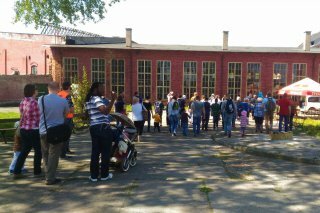 The October Open Day was the opportunity to break another records. And all that due to the two motorized groups which decided to visit us simultaneously o the same day. Therefore, we would like to report with pride that the number of guests had surpassed the magic border of 6134 people. 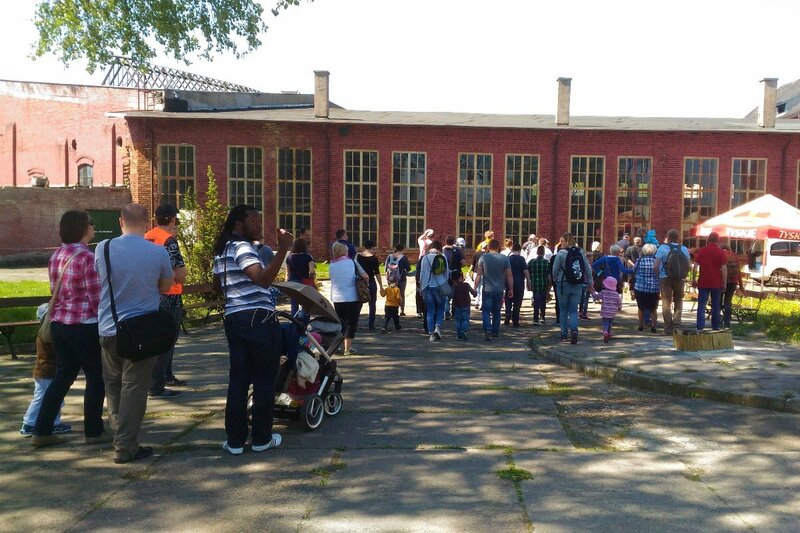 On Saturday, 1st October, the gate of the Shed was crossed by 409 tourists. 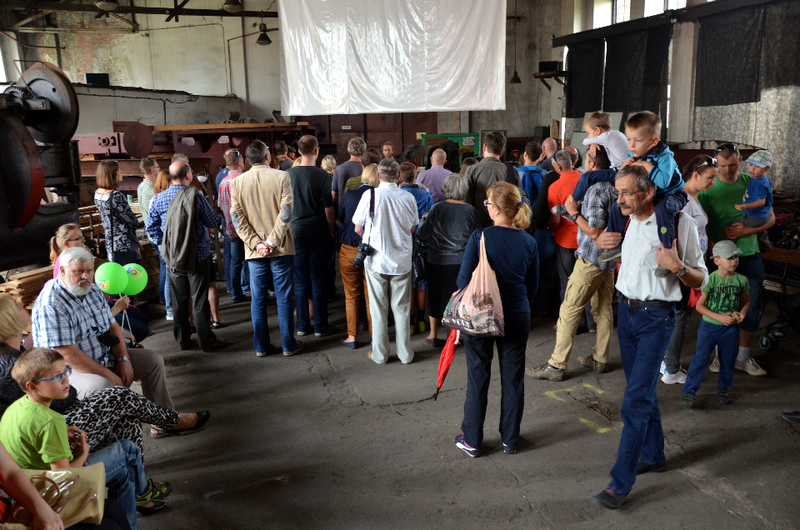 Thanks to that, this year’s visitors count reached already 6238 people. And that’s still not the end of the touristic season. 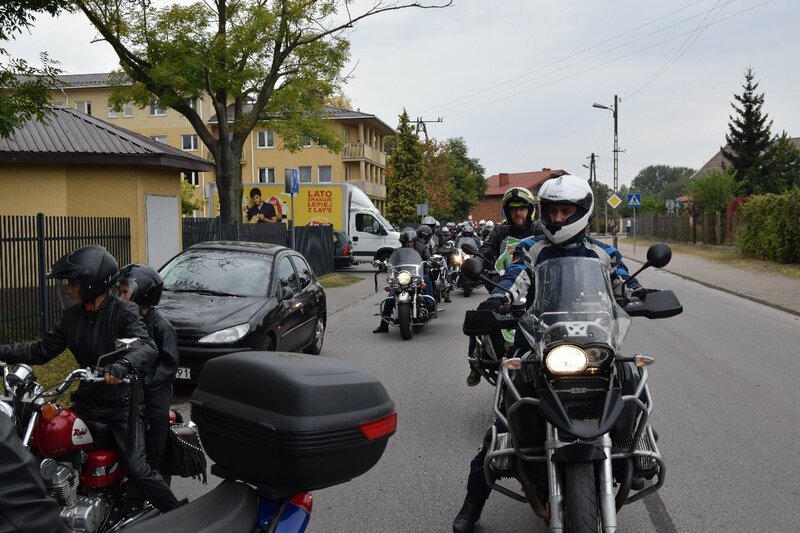 This impressive result is connected with another record number – never before were we visited by such a great number of motorcycles. 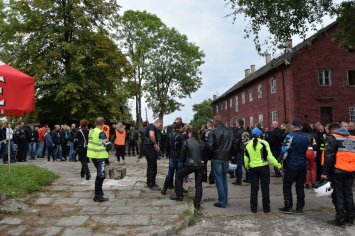 Thanks to the rally organized to celebrate the end of motorcycling season by the Sochaczew Motorcyclist Association 196 bikes arrived in the Shed. 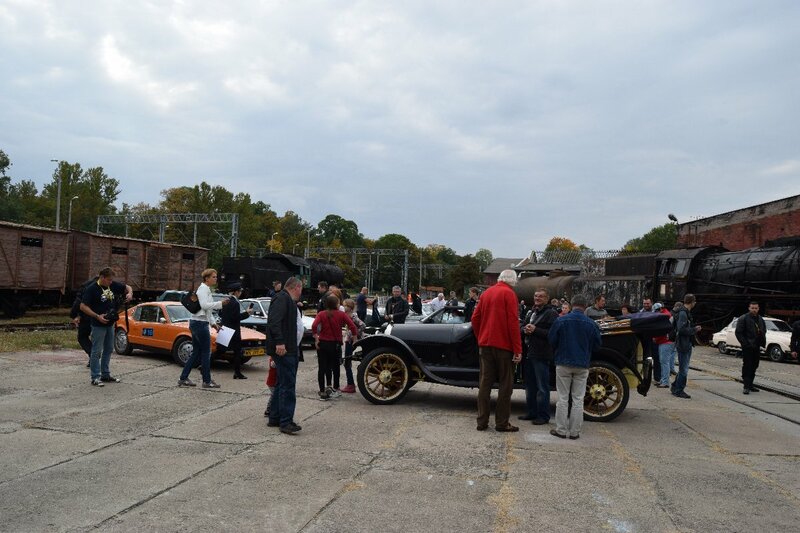 At the same time we were visited by the participants of 37th Warsaw’s Rally of Vintage Cars in the count of 27 teams. It’s worth noting that this is yet another such event which arrived in our facility from the neighboring Żyrardów. The individual visitors also did not forgot about us on that day. We would like to invite you to the Open Day in Engine Shed, which will take place on 1st October from 11 AM to 3 PM. 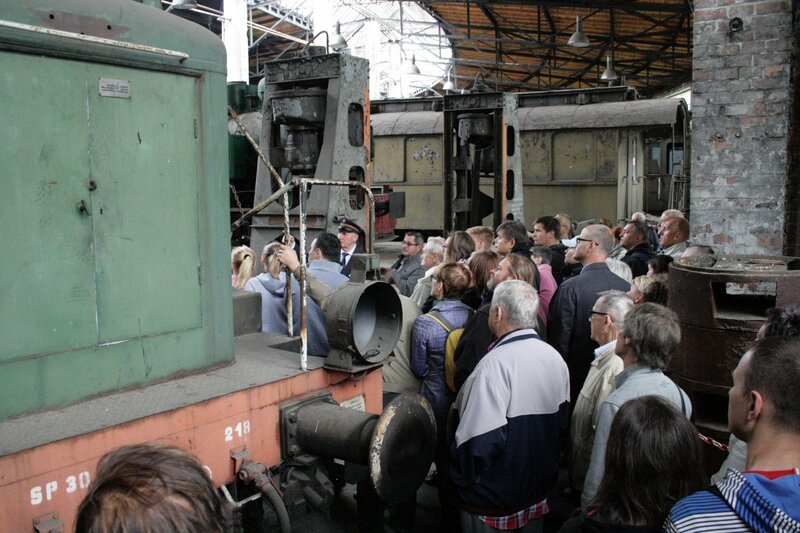 During the event one can visit the interiors of Skierniewice Shed and admire the collection of historical rolling stock. 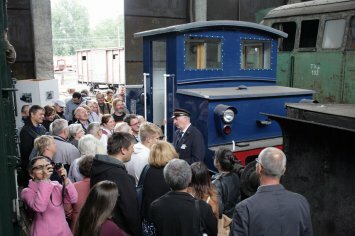 Our guests are awaited by guides dressed in a historical railway uniform. 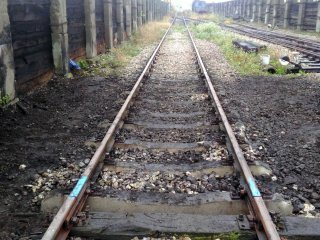 As in previous years we would like to present to you much longer sightseeing route inside the main roundhouse from 1862-1942 where the major part of our collection is stored. 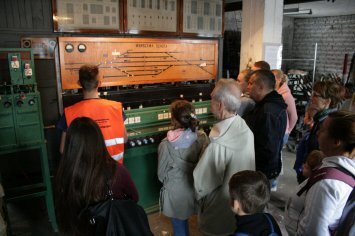 interactive exhibition of railway signalling and safety devices. Guided tours start every full hour (11 AM, 12 AM, 1 PM and 2 PM). 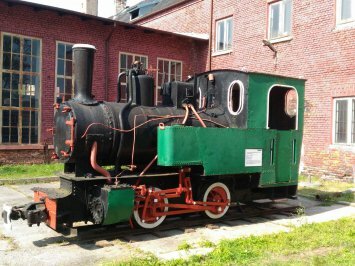 The narrow gauge steam engine “Ryś” (“Lynx”, factory number 1541) become the part of PARE collection at the beginning of the association’s existence. Similarly to other narrow gauge exhibits, it was the part of rolling stock of sugar factory in Leśmierz, near Łęczyca. 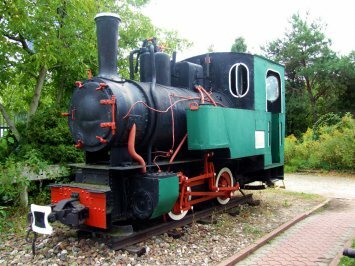 Initially, in exchange for external renovation it was lend to the Board of Commuter Railways (Central Board of State Railways in Warsaw) with intention to use it as cold exhibit in one of the narrow gauge stations. 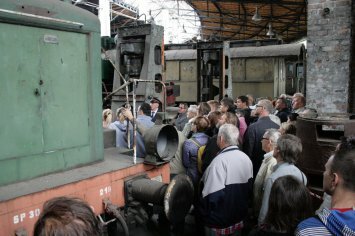 Due to the agreement between State Railways and the Museum of Railways, the engine finally became one of the exhibits of the latter institution. 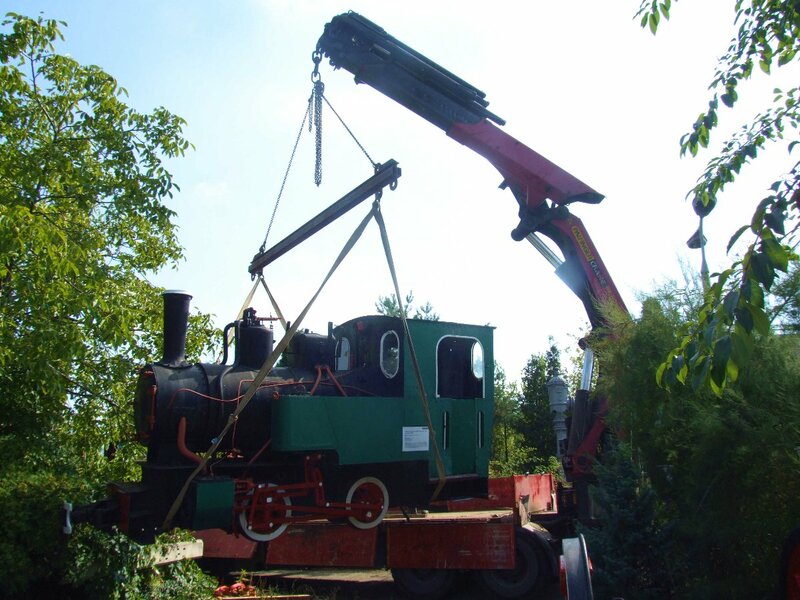 Unfortunately, the uncertain future of the Museum forced us to consider getting the engine back to Skierniewice. 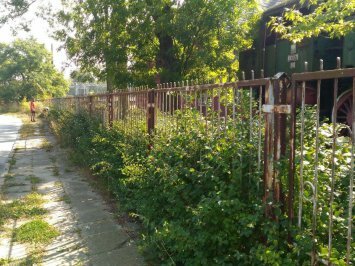 The perfect opportunity occurred in the end of August and beginning of September when City Council of Legionów was looking for a railway attraction, that could add splendor to the opening of new Communication Center in this city. After several consultations it appeared that “Ryś” is a perfect candidate for this purpose. After short formal agreements, a special lorry with loading crane arrived in Museum of Railways on 8th September in the morning. 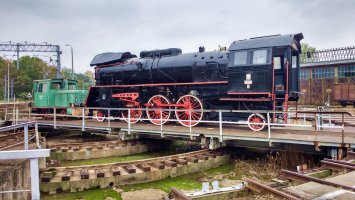 On the same day, the steam engine was placed in front of the new Legionów Station which was to be opened on 11th September. 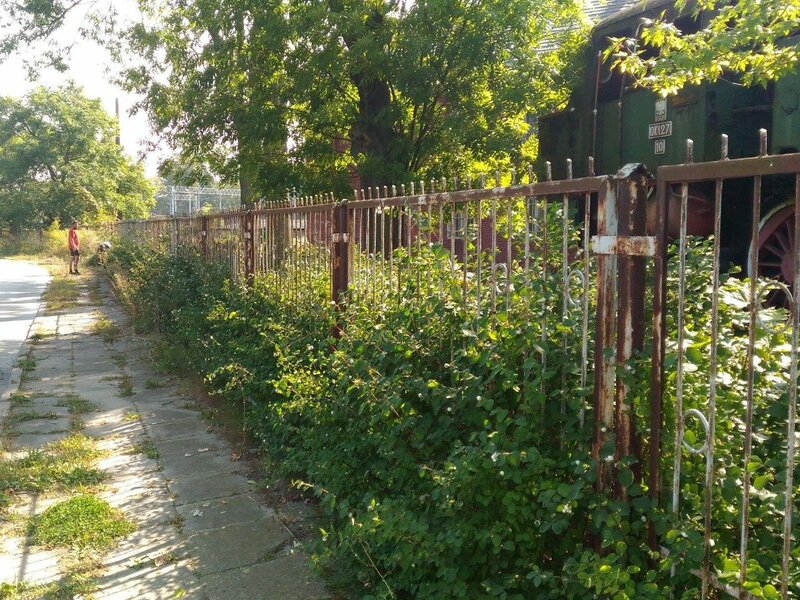 Before the vehicle arrived in Skierniewice, some preparation works had to be completed. 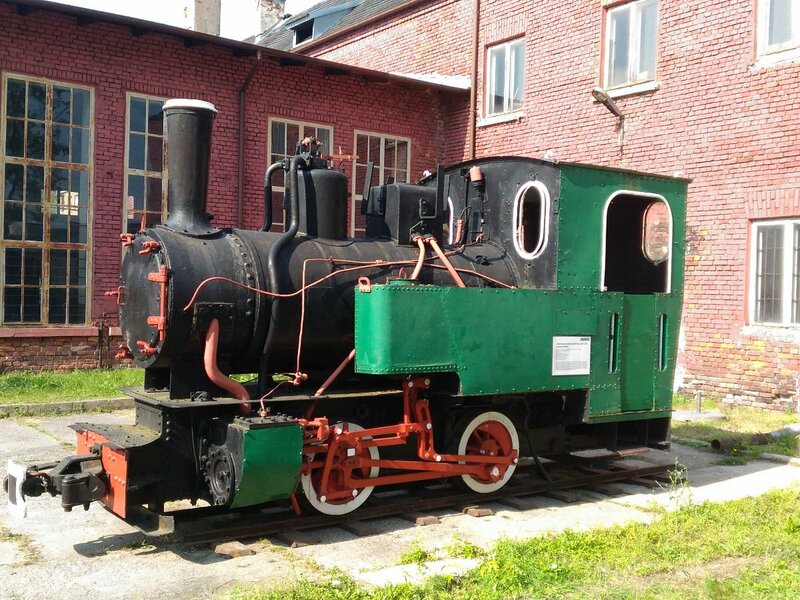 This time we decided that “Ryś” will be an outdoor exhibit. 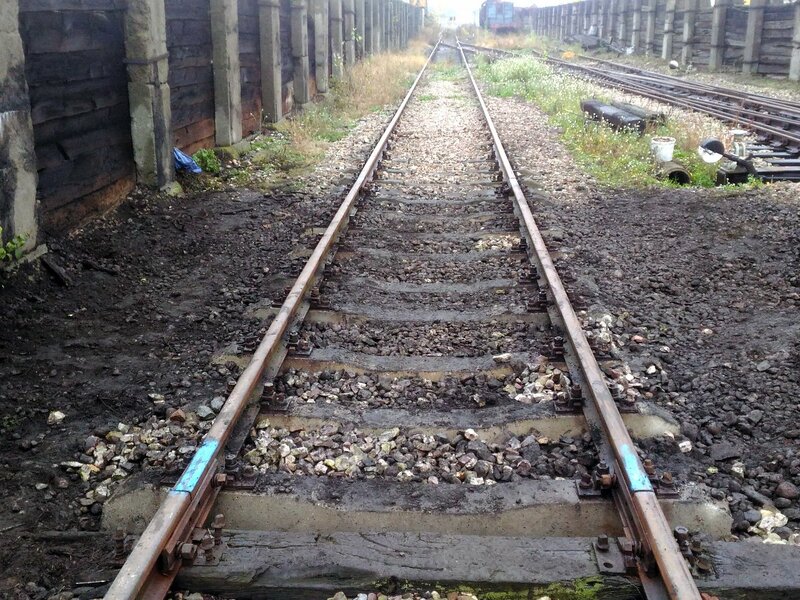 We needed to take out of the storage a section of a collapsible 600 mm gauge track. 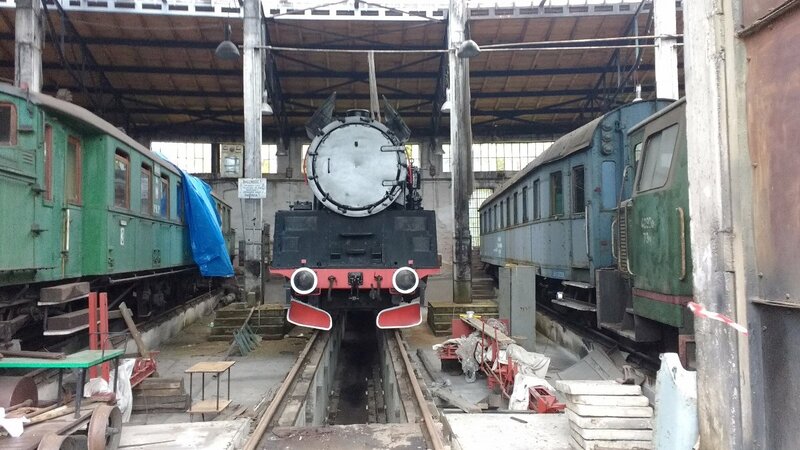 It was placed next to the entrance to the main workshop. 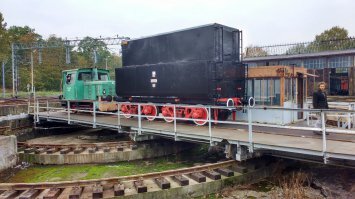 On Monday, 12th September after 10 AM, the lorry with long-awaited load arrived in Engine Shed. 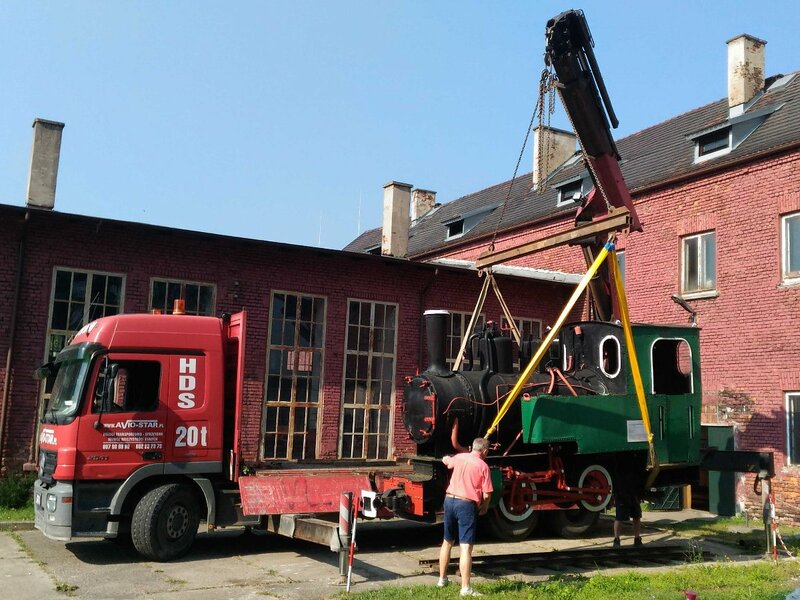 This way, after more than 20 years spend in Warsaw and a short stopover in Legionów, “Ryś” returned to Skierniewice. From 9th to 11th September the last, third part of the Volunteers Camp took place. 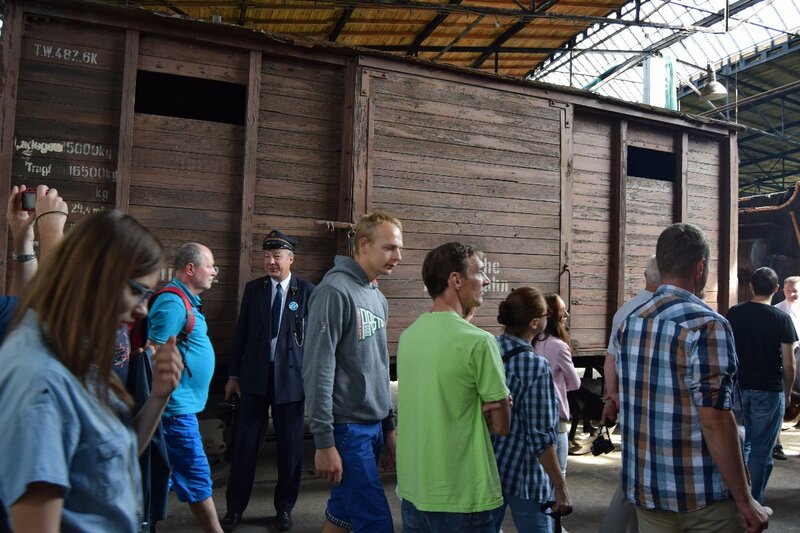 The camp is an event sponsored by National Heritage Board as a part of programme Volunteering for Heritage. 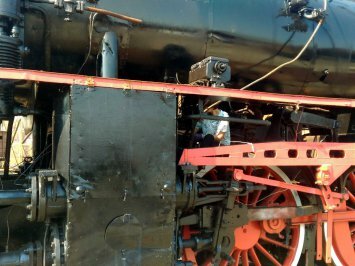 Contrary to the previous editions of the event, where most works were concerning the renovation of engine class Ol49-4, we decided to focus on general upkeep of the facility. 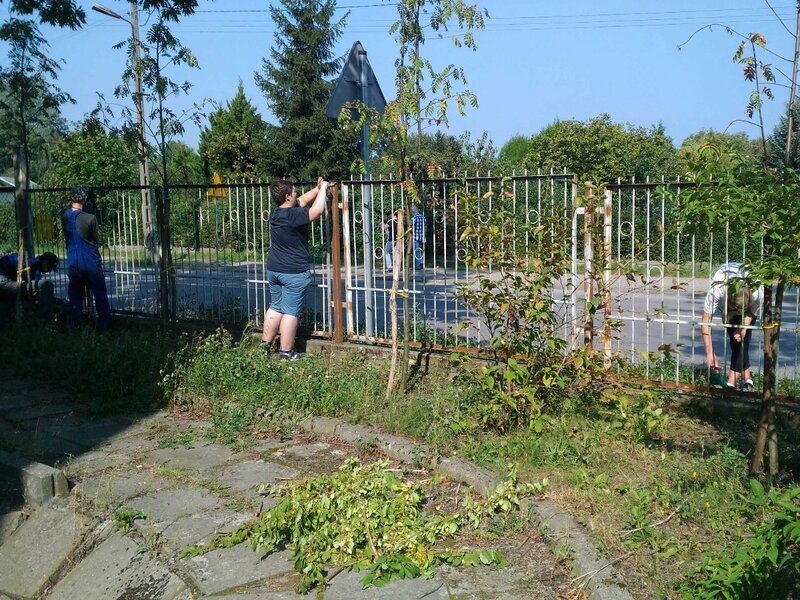 Scorching heat forced us to resign from some more labor-intense activities, like cutting down the wild bushes and instead tend the forgotten green areas in more shaded places. 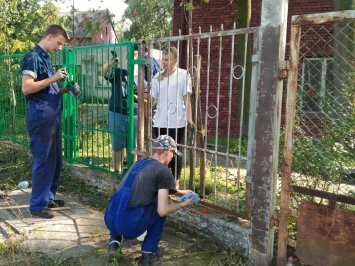 Thanks to the numerous participants (12 people) we were able to repaint the major part of the fence from the side of the street. Some time was also devoted to the good, old class Ol49. 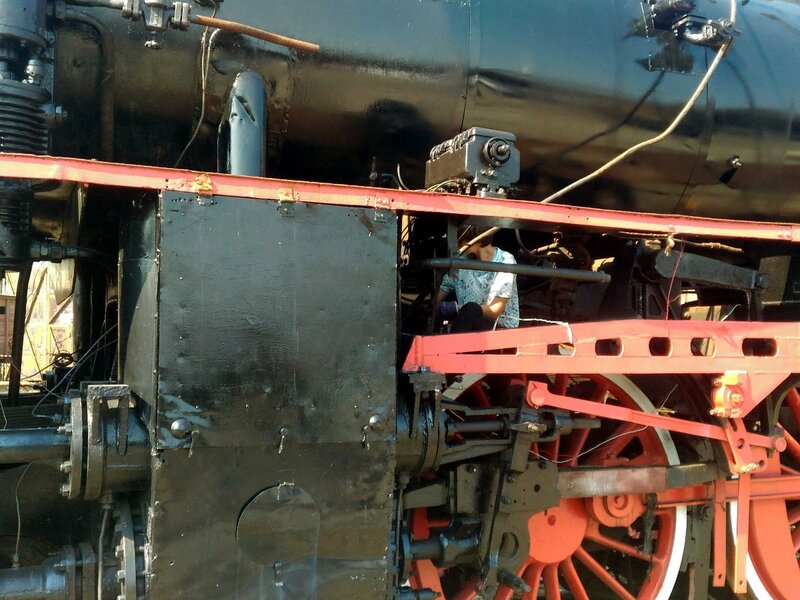 Volunteers cleaned up the more secluded areas of the frame, prepared the air tanks for painting and helped by the installation of steam dome cover. They also helped in tour guiding during the visit of youngtimers from Warsaw’s Automobile Factory (FSO). We would like to say a big thank you to the participants of all three camps. 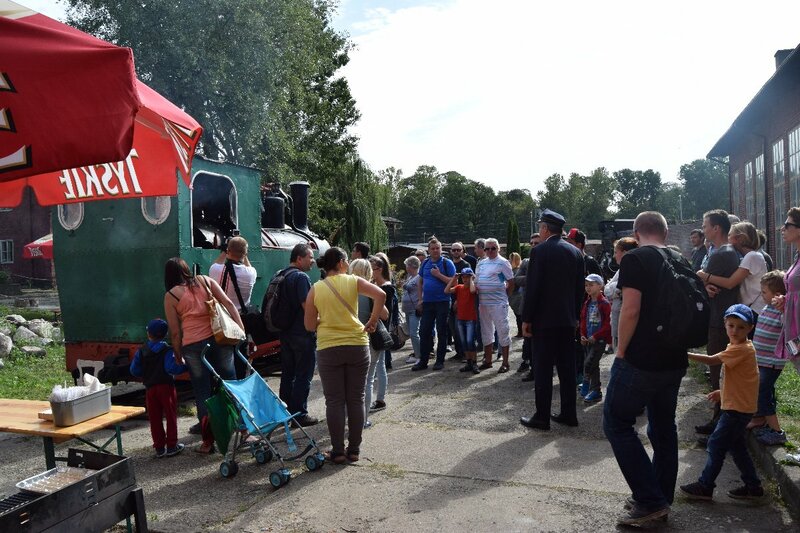 We would like to note that several volunteers from Łódź took part in all three events, and our guests from Szczecin and Wolsztyn helped in both holiday editions. 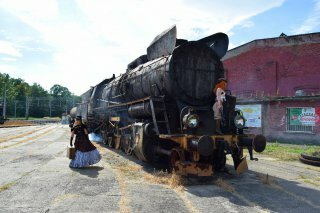 As a part of this project, yet in a smaller group, we are designing the new didactic sightseeing rout in the Shed. We would like to invite those, who still would like to take part in similar, but a bit more modest event, at the turn of month September and October. 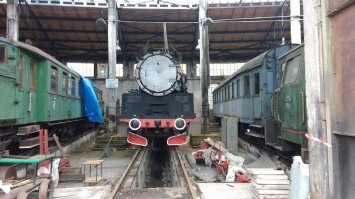 The beginning of September was mostly dominated by more intense sightseeing of Engine Shed. First, this month’s Open Day attracted 161 guests. 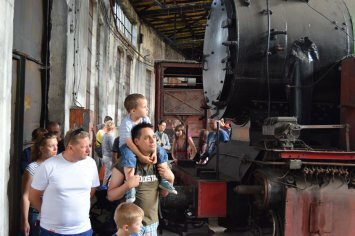 On next day (Sundat, 4th September), we admitted a couple of organized groups, including tour of railway fans from Czech Republic and United Kingdom, as well as participants of special photo plain-air. The participants of the latter event were mostly steampunk cosplayers, who took the advantage of the vintage and industrial surroundings of the Shed. Next week, on 10th September, we were visited by the participants of a special rally. Drivers of 22 cars originated in Warsaw’s Automobile Factory (FSO) choose the Engine Shed as a final destination of their trip. 15th Days of Public Transport (Sunday). 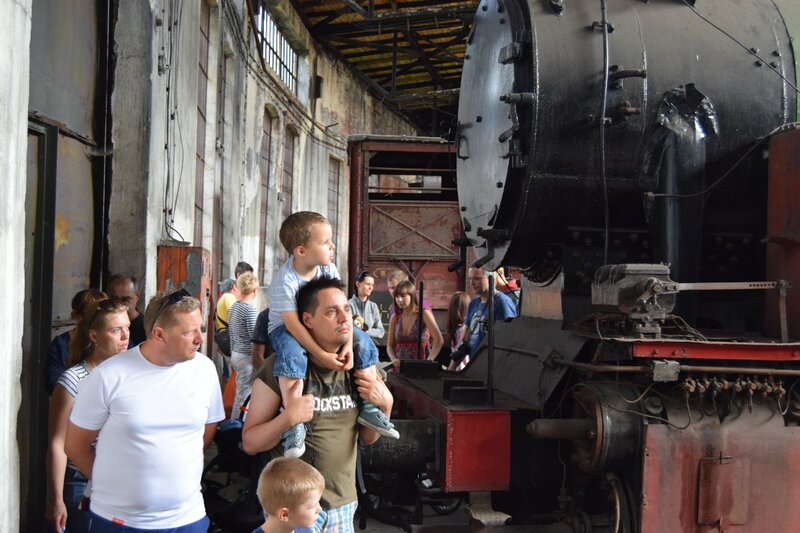 Except the interior of the roundhouse and the collection of historical rolling stock, our guests can visit the old workshop, the railway blacksmith shop, the exhibition of railway signals and the photographic exhibition “Railway in lens”. The sightseeing of the roundhouse will take place in guided groups, starting on each round hour (12AM, 1PM, 2PM and 3PM). Other exhibitions can be visited individually. The tired and hungry guests can try the grilled meals provided by the Atmosfera pizza house.